The sudden death of President Saparmurat A. Niyazov of Turkmenistan opens up a new chapter in the Great Game for control of the mineral wealth of Turkmenistan - and the Caspian Basin. Photo: In May 2005, President Bush and Laura Bush joined President Saparmurat A. Niyazov of Turkmenistan and the Ukrainian president, Viktor A. Yushchenko, to mark a World War II anniversary in Moscow. It should be remembered that Niyazov was a totalitarian dictator "for life" not unlike Stalin. Bush did not seem to mind marching alongside a dictator like Niyazov in 2005 as American boys died for "democracy" in Iraq and Afghanistan. This photo reveals just how shallow and false that claim really is. 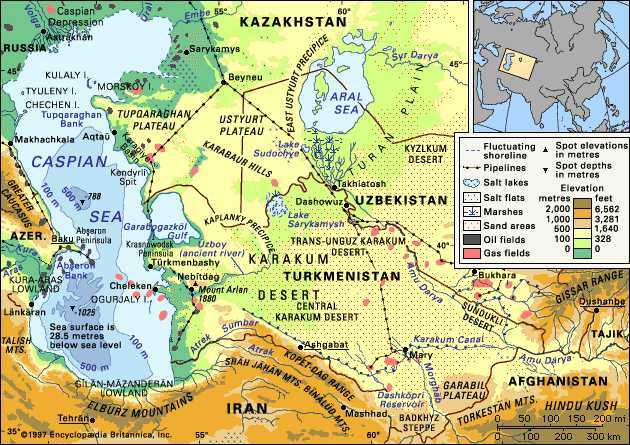 What matters most to Bush and his cronies is control of Central Asia and its mineral assets. Niyazov's death may have been natural or caused by poison or doctoring. What matters most is what comes next. Turkmenistan is a neighbor to Afghanistan and has a long border on Iran's northeastern frontier. This is key. The border of Turkmenistan is very close to Tehran. The Israelis have long played a key role in Turkmenistan and their strategy has been to find ways to export the immense oil and gas reserves of Turkmenistan to the West without passing through Russia or Iran.